Punjab Chief Minister Amarinder Singh flags off the inaugural Air-India flight (Amritsar- Birmingham- Toronto) from Rajasansi International Airport in Amritsar on Sunday. 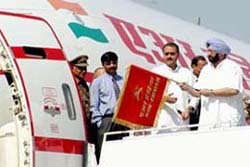 Also seen in the picture is Union Civil Aviation Minister Praful Patel. Is poor infrastructure alone the cause of slow disposal of cases? Defence Minister Pranab Mukherjee was heckled by a group of agitated Congressmen at the West Bengal Pradesh Congress Bhavan here today prior to the announcement of the list of United Democratic Alliance candidates for the June 19 Kolkata Municipal election. In a move to maintain its distance with the UPA government, the CPM Polit Bureau today decided against participation in the Congress-led coalition government’s first anniversary celebrations on May 22. Unfortunately, no political party likes to be disciplined, especially when the Election Commission has to enforce rules and regulations strictly. It is not only members of the Rashtriya Janta Dal, who are often accused of travelling in trains without ticket, a senior member of the Punjab Council of Ministers, Mr Jagjeet Singh, too, found himself in a piquant situation early this month in New Delhi-Chandigarh Shatabdi Express when he was charged for travelling without ticket. ‘Kaun Banega Crorepati’, the Amitabh Bachchan-hosted quiz show on Star TV that had soared on the popularity charts, will be back on the small screen along with its superstar anchor and enhanced prize money. India has conveyed its convenience for attending the next SAARC summit to be held in Dhaka on November 12-13, Foreign Office spokesman Navtej Sarna said today. India has conveyed this to Pakistan, the current chairman of South Asian Association for Regional Cooperation (SAARC), and also informed the host country, Bangladesh. Bowing to the pressure of Sikh organisations, the director and producer of the controversial film, ‘ Jo Bole So Nihal’ today agreed in principle to accept all recommendations of the 15-member SGPC panel regarding removal of objectionable scenes from the movie.